SEASONAL: Yes, Memorial Day-ish to Labor Day-ish. Check with CT State Parks. STAY LIMIT: 14 consecutive days which may be repeated after a 5 day period where all parties of the campsite have been out of the campground. SEE ADDENDUM AT BOTTOM. FIRST-COME-FIRST-SERVED: No sites are held for this purpose but walk-ins are accepted when sites are available. GPS: N 41.70710, W 073.38381 marks the campground turnoff from the road that circumnavigates the lake. 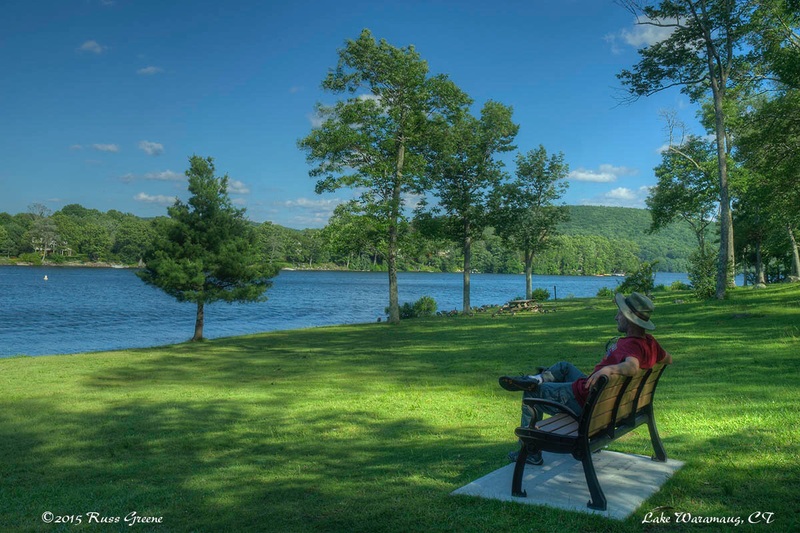 Cabins can be rented at Lake Waramaug State Park, New Preston, CT.
ACCESS: Roads to the campground are paved, but narrow, shoulder-less and in places windy. Avoid West Shore road (the road that travels around the south side of the lake). Do not count on cell service here, but see my notes immediately below. It is possible to get good connectivity with AT&T and Verizon by driving about 5 minutes around to the other side of the lake and up the hill about a block on one of the two side streets. Free wifi can be found at the Hopkins Inn, Hopkins Winery, and in New Preston, 9 Main Bakery/Cafe. Someone with Sprint was able to get 3G, emails and texts. 1-2 bars, LTE intermittently but I could not transfer much data. Emails downloaded quite slowly when they downloaded at all. Still, the booster allowed for some service that without it did not exist. My SpeedTest app indicated Network Communication Issues and I could not use it to measure data throughput speeds. 1-2 bars, 1x but I could transfer no data. My SpeedTest app failed to connect. Charlene, my RV, and PeeWee–the best little blue motorcycle -ever!–resting in space 18 at Lake Waramaug State Park Campground, New Preston, CT. Sites are mostly grassy. A few have some gravel. RECYCLING: The hoppers indicated yes, but I didn’t see any clear provision for separate materials except cardboard. Campground staff told me that all recyclables go into the hopper marked “cardboard”; that they have requested better signage. It seemed there was confusion amongst campers about reccling as all the hoppers I looked into seemed to contain trash. There were a lot of tenters at Lake Waramaug State Park Campground, New Preston, CT, and a few RVs too. BUGS: Nothing annoying when I was there in late June but in the evening on a hilltop around the other side of the lake the mosquitos were bothersome until I put on repellant. I visited the campground again in late July and got a lot of bug bits around my feet and ankles. I don’t know if they were chigger bites or possibly sand fleas. I’m also not sure if it had anything to do with the time of year. Might have been that I went out in sandals without bug repellent. Propane: AllStays indicates Cozy Hills Campground, Bantam, Connecticut 06750 – 1311 Bantam Rd. that would be about a 20 minute drive from the campground. Groceries: Northville Market in Northville or New Milford (it’s unclear), 10 miles or so, less than 20 minutes drive. It’s a small market but will probably have most of what a person might want. 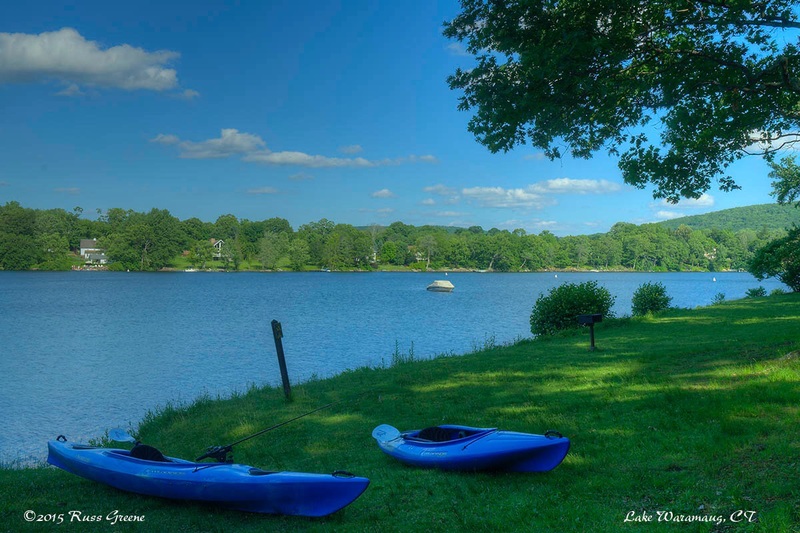 RV Parks: Cozy Hills Campground, Bantam, Connecticut 06750 – 1311 Bantam Rd. that would be about a 20 minute drive from the campground. Lake Waramaug, New Preston, CT. I was there in late June. Weather varied from sunny, warm and muggy to cool and rainy. Kayaks and canoes can be rented at a concession stand. 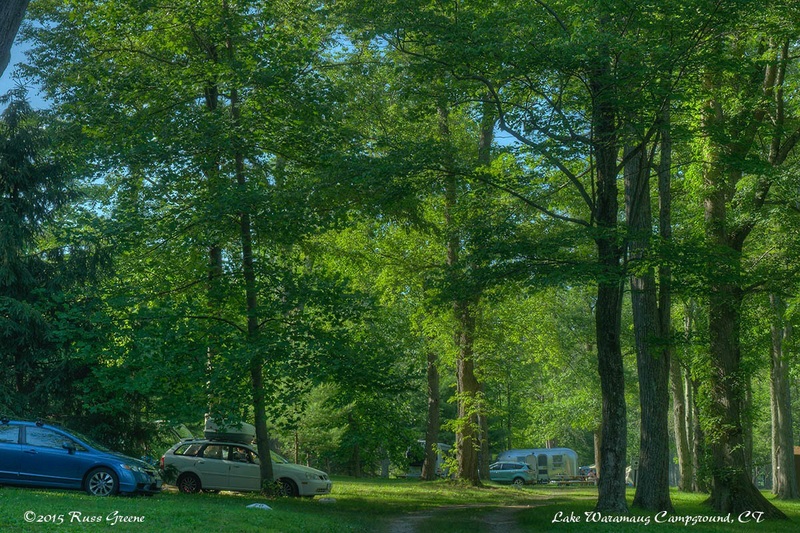 Lake Waramaug Campground is a Connecticut State Park Campground. For CT residents it’s $17 a night. I was a bit taken aback when I was billed $27 a night on the ReserveAmerica web site. It’s very hard to find out what you will actually pay on their site and I wish more people would complain about this to the various entities that hire them to handle their reservations. While it is possible to get to the campground via two different roads off of highway 45 to the east I would recommend avoiding West Shore (I think that’s what it is called) road for all but the smallest rigs because the road is narrow and windy with some sharp turns and no shoulders. I think there is a route in from the north but I have not investigated this. See the sidebar for a screen shot of a Google Maps rendition of the area. The road to avoid is the road on the south side of the lake. The blue dot near the top left was my campsite location. The green area surrounding it is the campground. Lake Waramaug, New Preston, CT. The campground itself is a large grassy field on a gentle slope with thin to moderate tree cover in places. Parking is on the grass, or in a few sites the surface is more gravelly. While there is no buffer zone between campsites per se, the campsites themselves are wide, perhaps 40′ or so. They are delineated by painted blocks on both sides so that neighbors can tell where one ends and the next begins. 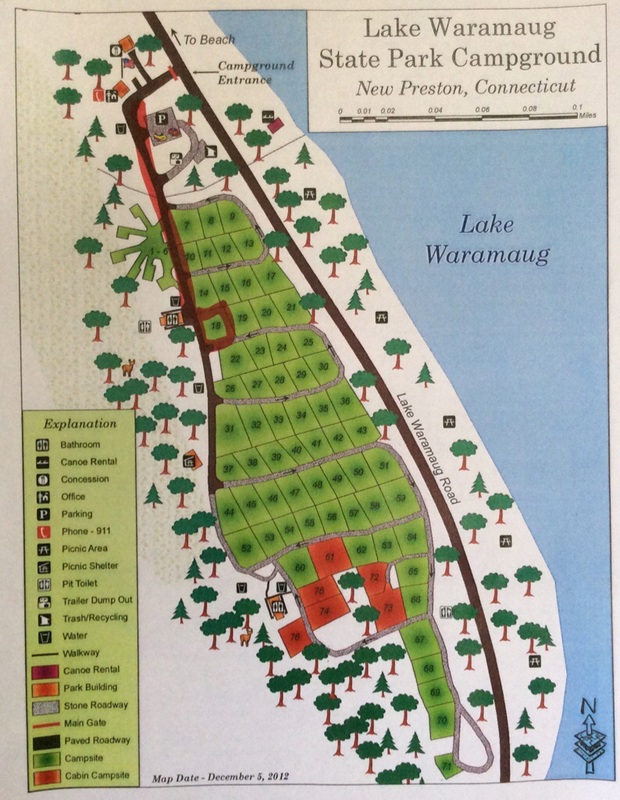 Map – Lake Waramaug Campground. I was in site 18–staff drew the red line on the map to show me the way. 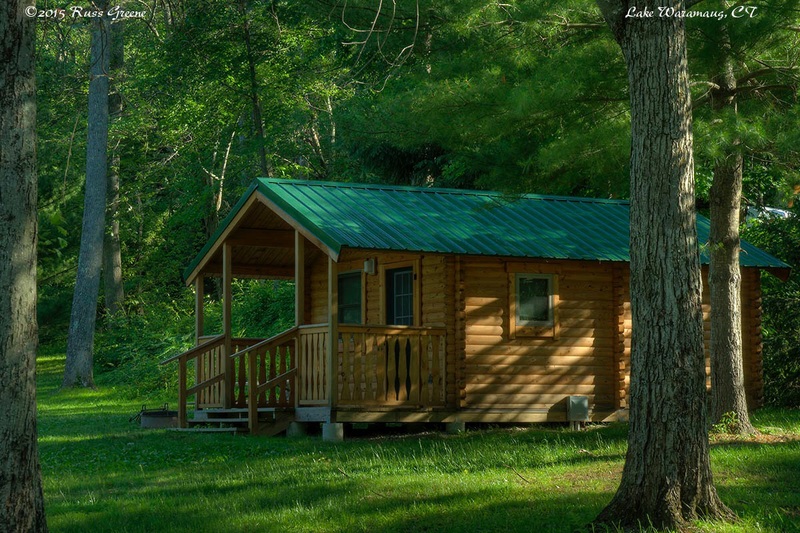 Besides tent and RV camping, the latter with no hookups, the campground also has a small number of cabins for rent. They were $60 for non CT residents when I was there; $10 less for Connecticutions. (Like Lilliputions–I just made that word up cause I don’t know how people from Connecticut refer to themselves.) Canoes and kayaks can also be rented at a concession stand along the water’s edge just across the road from the campground. A small swimming area has been roped off near the campground as well. “Car top” boats may be launched onto the lake. During my canoe paddle around the lake I was sure Godzilla was preparing to surface from the murky depths when I spotted a bubbling cauldron in the middle of the lake. Turns out it was just an aerator… at least that’s what somebody told me. 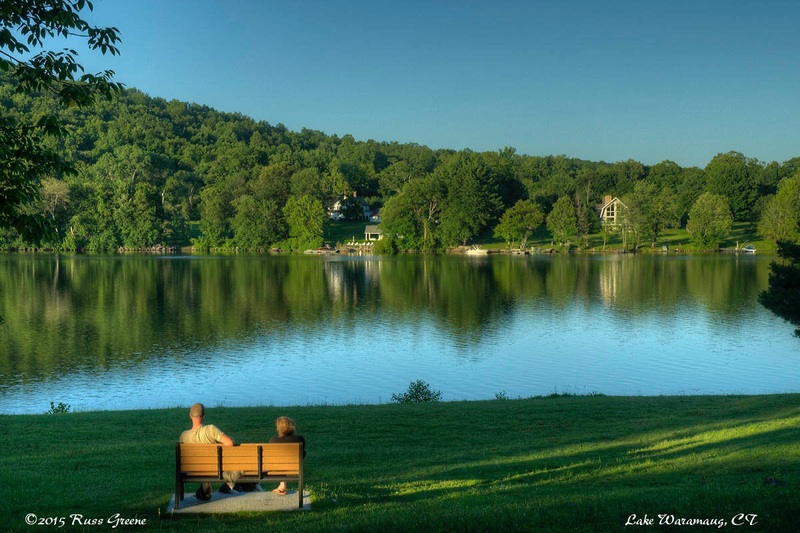 Lake Waramaug is a very short walk from the campground–just across the road. Although I’m uncertain of it’s exact size it is to circumnavigate it is 8 miles. Unfortunately, there is no hiking or bicycling path by which to do so and people that hike or bike around the lake travel on the narrow, mostly shoulder-less road. The speed limit is 25 and local residents, I’m sure, are used to bicyclists and pedestrians on the road. 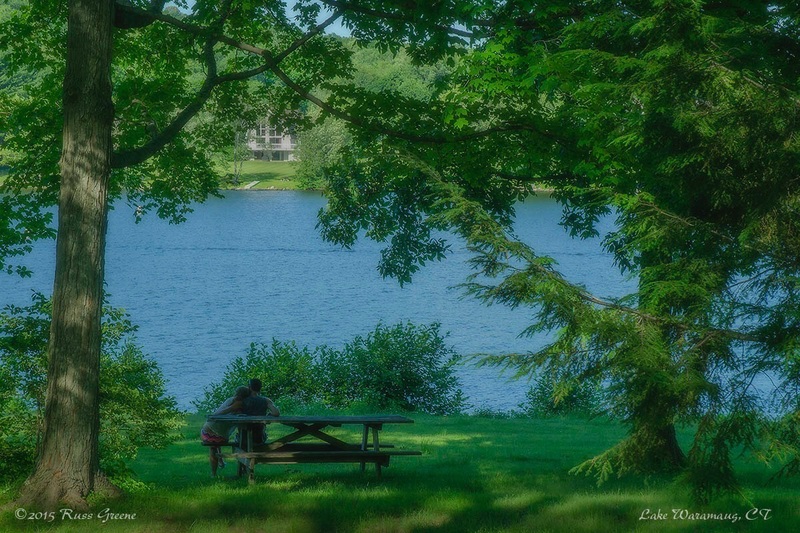 Lake Waramaug State Park, New PRESTON, CT. The blue dot at the upper left of the lake is where my campsite was. The surrounding green area is the campground and park. I advise traveling the north shore of the lake and avoiding the southern shore if you’re driving an RV longer than say 20′. The roads are narrow, shoulder-less and windy in places. The nearby Town of New Preston, maybe 5 minutes up the main road outside the park (rte. 45) and 5 minutes to get to the main road, is a cute little town, and I mean little. Don’t expect to find much there. There is a small bakery/deli called 9 Main, open till 3 or 3:30 that has indoor and outdoor seating as well as free wifi. The address? Guess. Oh, alright… it’s 9 Main St. I don’t know what else is to be found in New Preston. My first couple days at the campground were more peaceful than the next which fell on a weekend and the place was flooded with families, which I don’t mind. Quiet hour, which begins at 10 PM wasn’t observed precisely but it wasn’t long past 10 when things settled down. When I checked in the campground staff informed me of Lights Out at 11 PM? Lights Out? Is this camp, or a campground? Turns out what they mean is campfires should be extinguished by then. 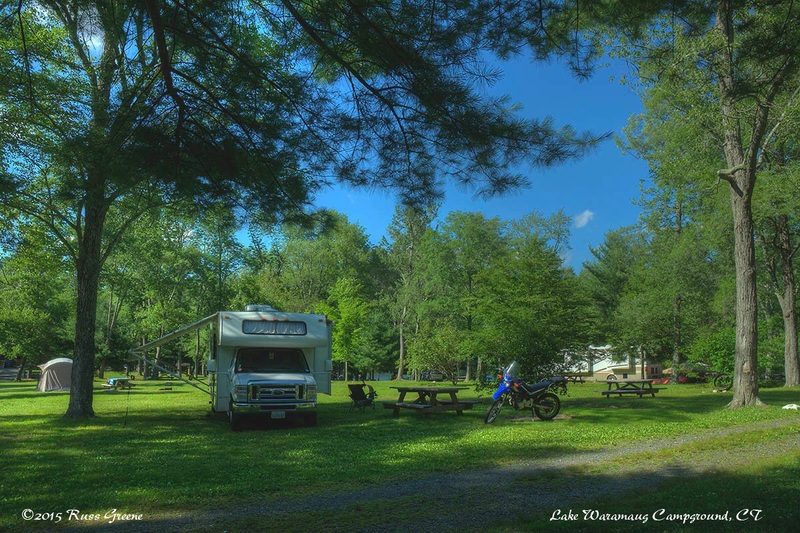 It seems to me that Lake Waramaug is a destination campground, meaning, you come here to be here rather than to have a place to park while you visit the surrounding areas. Oh, I’ve been told that there is a little winery on the far side of the lake that has wine tastings and live music on weekends. I think I’ll check that out this afternoon. 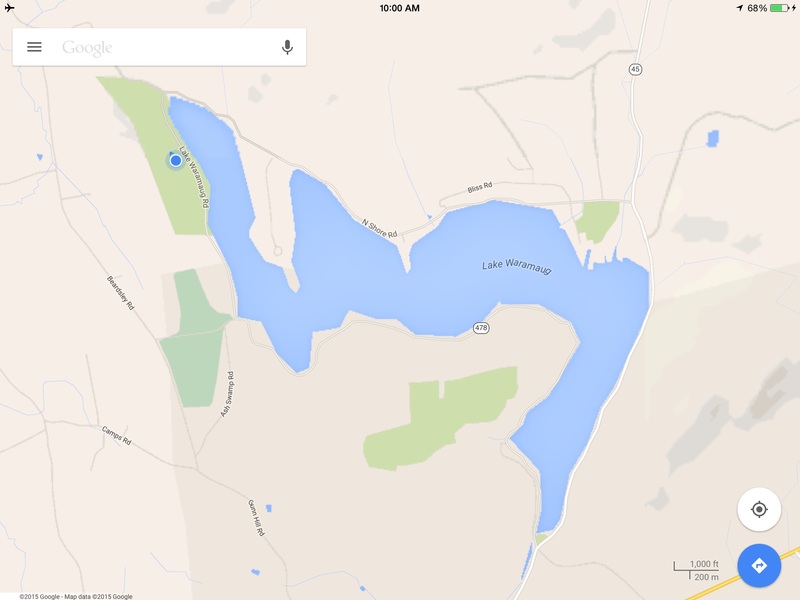 Addendum 8/25/15: I have stayed at Lake Waramaug several times now. After making and paying for my current reservation via ReserveAmerica I received a phone call from an offical at the campground saying I couldn’t stay there, that my reservation was no good because you must vacate the campground for 5 days before returning after a “stay of any length”. (I had been away just one day.) That’s not what it said on the ReserveAmerica web site when I consulted it prior to making my reservation and that’s not what I was told when I called the campground to make sure my reservation plans conformed with campground rules. Quoiting the ReserveAmerica site verbatum there was a clause under the Alerts and Important Information button on this page button that that read “The maximum length of stay is fourteen consecutive days. If you have a 14 day reservation, all members of your camping party and your camping equipment must leave the park for 5 days before you can return.” My interpretation of that clause was as it says: if you have a 14 day reservation you can’t return for 5 days. So, it would seem if you stay less than 14 days the rule would not applu and that you could leave for as little as a day before returning. While speaking with the official at the campground I was told that the CT State Parks web site has contradictory information that says you must vacate for at least 5 days after a stay of any length. It turns out this was quite correct. You may or may not be able to find this information even when searching specifically and deliberately for it. It certainly wasn’t presented up front when I visited the state parks web site. So, in fact there was conflicting information on the state parks site and ReserveAmerica. Equally true is that I never saw the information on the state parks site. Why would I have seen it? ReserveAmerica handles the bookings and financial transactions. There is no reason for somebody to search out length-of-stay rules for the campground on the state parks site when it is presented at ReserveAmerica. There is no reason to go to the state parks web site at all if ReserveAmerica has the information you seek. I called the state parks office and after explaining the problem, several phone calls and some slightly heated discussion, an official there arranged to have my current reservation honored. Everything about this problem was unpleasant and worrisome to deal with and none of it should have happened. It would have been completely unnecessary and should have been unnecessary: if only the ReserveAmerica web site reflected the rules as stated on the state parks web site. Any feeling as to how closely the 5 days out after 14 in rule is enforced? We were hoping to bend the rule a bit for an extended stay. Funny you should ask. I was just now doing a little research on policies and rules. I can’t tell you how judiciously they enforce the rule but my reading of the rule as stated on ReserveAmerica.com would seem to indicate it only applies to parties staying a full 14 days. So, you could stay 13 then leave for one and return the following day. I’m not sure if that will be helpful to you, and it would be a hassle to have to do things that way, but you could conceivably stay for a long time if you are willing to vacate for 24 hours every couple of weeks. There are a couple other state park camping options in fairly close proximity. You might consider staying 14 days at one and 14 days at another. Here is an update: I am currently embroiled in a mix-up at Lake Waramaug. After staying 6 nights I planned to check out for a day, tomorrow, then check back in for a week. After making the reservation and paying for it on ReserveAmerica.com, someone from the campground called to say we couldn’t do this because the state park rules say you have to stay out of the park for 5 days regardless of how long your previous stay was. I was referred to the state park web site where indeed this does seem to be the regulation. However, THAT IS NOT WHAT IS SAYS ON RESERVEAMERICA! All it says on ReserveAmerica.com is that you have to vacate for 5 days if your reservation was for 14 days. I phoned the state park web site and spoke with someone, explaining that I followed the rules as presented on ReserveAmerica but I’m being denied a campsite even so. I pointed out the disparity between the information on ReserveAmerica and the state park web site while explaining the sites present conflicting information and that I had no reason to ever see the information on the state park site since reservations are not handled there. I asked that I be allowed to keep my new reservation and I’m waiting for a return phone call. I’ve added an addendum to my report about this campground which fleshes out the story a little more than my previous replies to your comment. I would also add that based on what I know you can probably expect the 14 day rule to be enforced.